The Montreal Canadiens kicked off the new year with a victory against the Boston Bruins at the 2016 Bridgestone Winter Classic, polishing off the opposition by a final score of 5-1. The Original Six rivalry took on new dimensions on New Year’s Day, but in the end it was the Canadiens who managed to slip up the standings to land in first place in the Atlantic Division. The Habs got five goals from four players, with their top line producing six points. Paul Byron had two goals, while Brendan Gallagher made his return to the lineup with a two-point performance that found him skating once more with Max Pacioretty and Tomas Plekanec. Matt Beleskey had the lone goal for the Bruins, who had to play without injured centre David Krejci and suspended forward Brad Marchand. Goalie Tuukka Rask made 25 saves on 30 shots. But the day belonged to local native Mike Condon and his Canadiens, who may have finally put an awful 3-11-0 December behind them. After David Desharnais opened the scoring 74 seconds into the game, Montreal never looked back and their netminder kept the door closed for 27 of Boston’s 28 shots on goal. Condon’s best save came on a Ryan Spooner chance with just a hair remaining in the middle frame. The Bruins have now hosted the Winter Classic twice, becoming the first team to do so. They last hosted in 2010 at Fenway Park, but the road team has won six of the eight Winter Classic games. 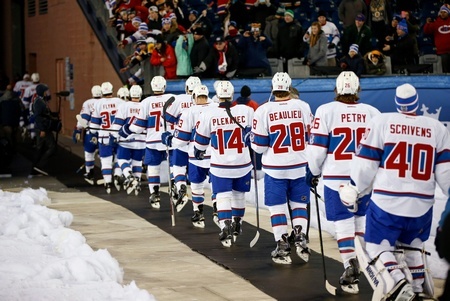 The Canadiens have now participated in three outdoor games, starting with the 2003 Heritage Classic in Edmonton and continuing with the 2011 Heritage Classic in Calgary. They have to hope that this victory will put them back on the right path, with a new year of possibilities to anticipate and a renewed top line to work with.